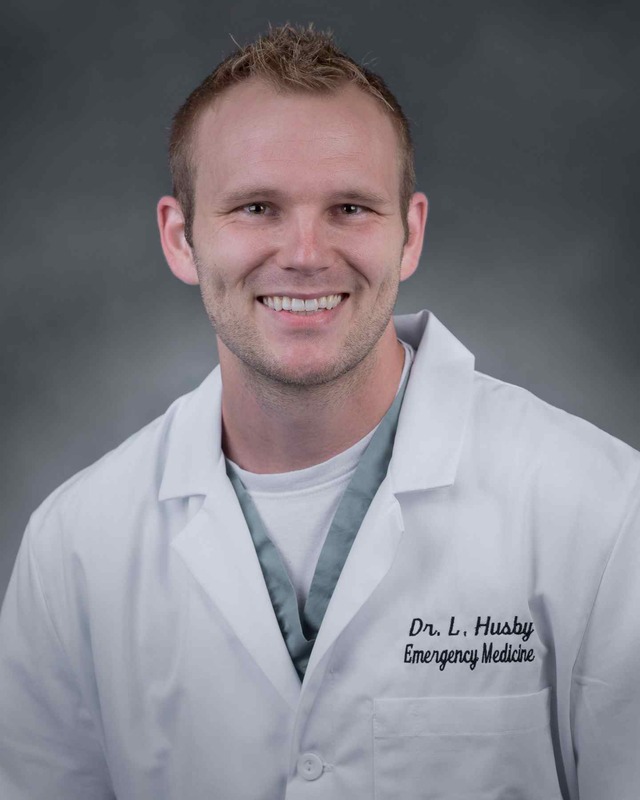 Dr. Husby is chief resident of the Palmetto Health EM Class of 2016 and a graduate of North Texas State Medical School. On a cool Monday afternoon the plane to Dulles then Frankfurt and ultimately Bangalore, India took off landing two calendar days later and about 40° f warmer with a weather prediction of "smoke" for the day. I was greeted by a driver only speaking Tamil to take me to my hotel room less than a mile from the hospital through surprisingly congested traffic that held no regard for traffic lines or signs. 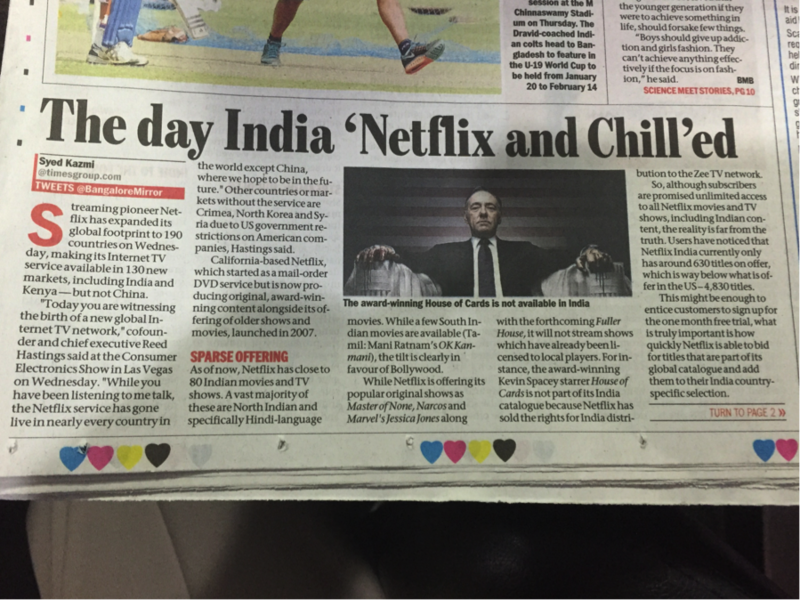 The following morning before I began working with the "students" which are resident equivalents in training I caught up on the big news Netflix was beginning to take hold in India. 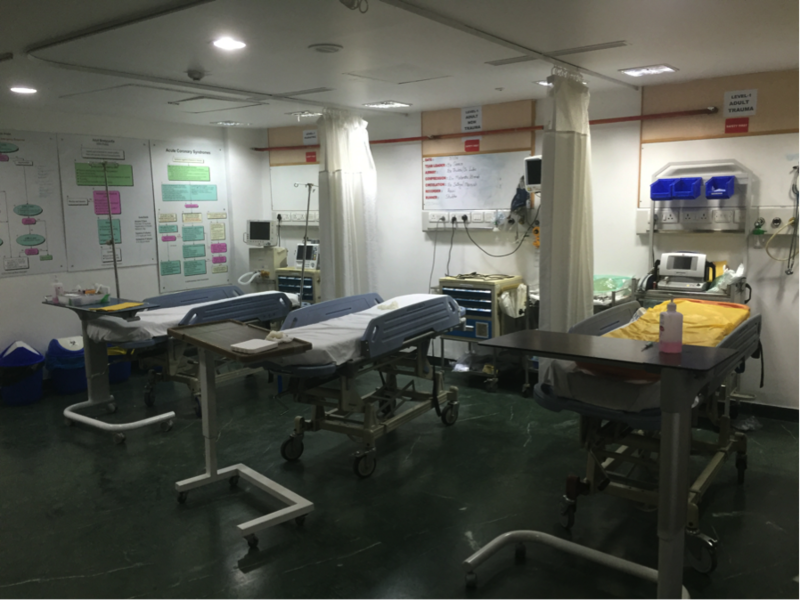 The ER in Bangalore is essentially a 10 bed emergency department, divided into a high acuity and low acuity section. The high acuity portion is pictured. One patient, in particular, brought an entire herd of students in to see him. 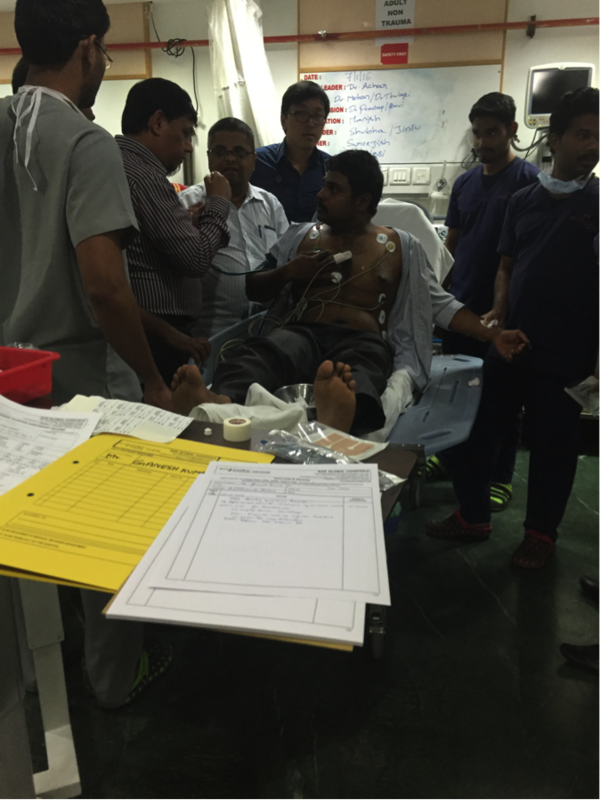 He presented with shortness of breath and was diagnosed with a spontaneous pneumothorax. The chest x ray is shown below. With an ER volume of only 23-25 patients per day, each patient is greeted by multiple students prepared to examine them. 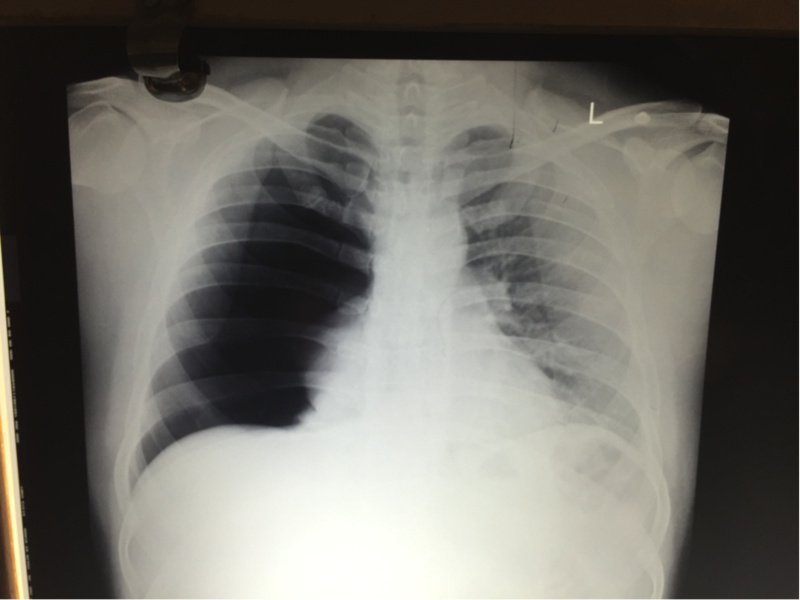 His chest x ray prior to placement of his "ICD" or chest thoracostomy tube is pictured below. After 3 days of morning and afternoon lecturing sessions as well as bedside teaching we were able go out for an evening of sari shopping and trying out the multitude of sweets and street vendors. After Bangalore a couple short flights later I landed in Madurai "the temple city" home of one of the oldest and most impressive temples in the world. It was mentioned as far back as the 7th century and built in honor of the goddess Meenakshi. 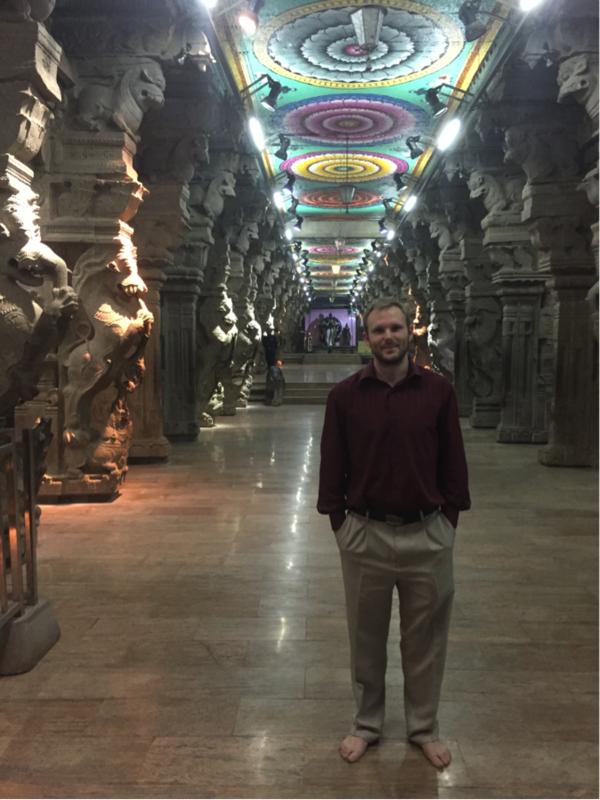 Below is a picture of me in the hall of a thousand pillars, in front of the statue of Meenakshi, which is said to have 1,001 pillars by the locals attending. Within the temple are multiple towers, a central pool, and amphitheater in the heart of the complex which has multiple wings. The temple has a clearly marked cutoff area for anyone not there to worship, and I was not allowed to pass through the central part of the temple. It was very busy throughout the temple and many people came from far away to visit the holy temple. There was incredible architecture and intricate carvings everywhere. Meenakshi temple was not the only temple of the city, nor historical building as we were able to visit another temple and the museum of Ghandi. On the road you walk in on the various tenets of Hinduism as described by Ghandi can be seen, although per the halls of the museum the "Mahatma" nickname was given to him meaning "great soul." The emergency department was more of the same with regards to the theme of the city. The 4 wings of the hospital were buzzing at all hours. After "The Temple City" I hopped on another quick flight over the coastal city of Chennai for three days of lectures and bedside teaching. The residents each day would come pick me up and take me to their facility to deliver their own presentations and then we would review the topics of the month as we had in the previous two sites. 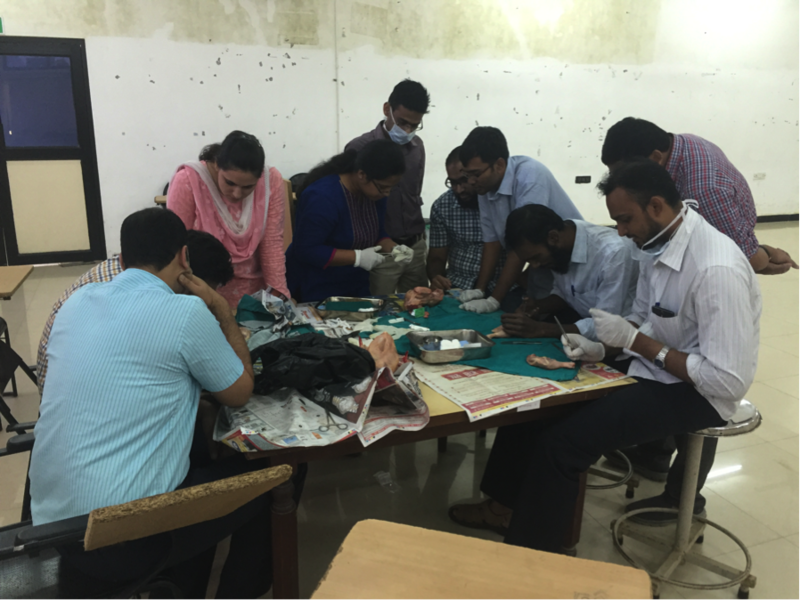 We also had a suture lab and had the residents pracice their suture skills on raw chickens. As our monthly topic was that of soft tissue, we had several techniques to practice. As I was here during the festival of Pongal we were able to enjoy some of the festivities on the beach and at the many streetside restaurants. 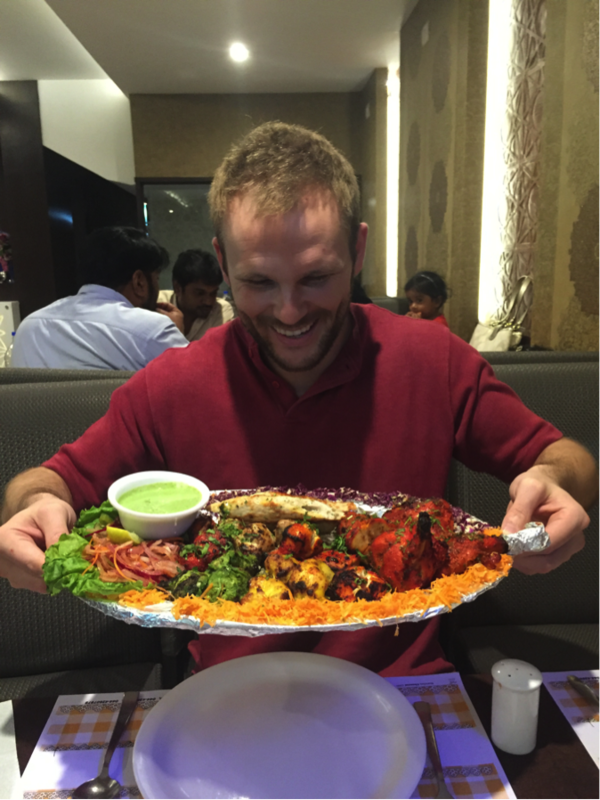 I was able to visit one of the nice restaurants and had the "non-veg" platter as any Texas native would hope to partake in. After 4 days in Chennai and a great time taking part in the festivities and fun I had the opportunity to enjoy a 37 hour Monday traveling West to Columbia. Overall, it was a great experience with eager student residents during a great time of the year to be in the typically hot India. We all learned a lot from each other and enjoyed the holiday together.